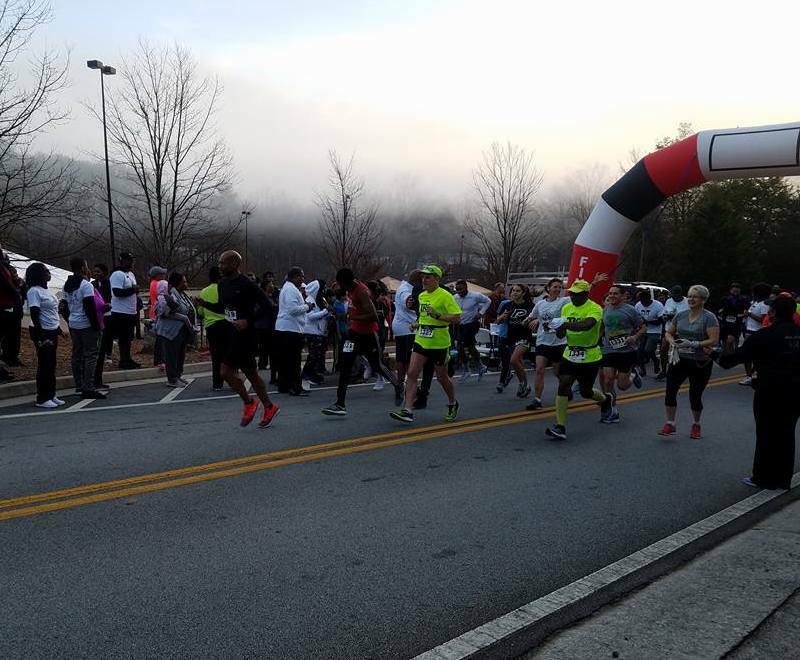 Each year on the Saturday before the Martin Luther King holiday, the Livvy's Love Foundation sponsors a 5K / 8K fun run / walk at Stone Mountain Park. I've run the 8K race the previous three years, finishing in a fairly narrow range of times from 42:04 (2016) to 43:59 (2014). As I've been nursing the calf strain and recovering from the Red Nose Half Marathon last weekend, I didn't run at all this week. With the first week of classes, the challenge of developing a new angle on the organic chemistry course, blending in some elements of physical chemistry, and some frustration with a new system for posting course materials and pre-class assignments on-line, and Bonnie's birthday on Wednesday, it was difficult to work in any mid-week runs. This morning was a perfect day for running, 50 deg F and mostly clear skies, with a little light and scattered fog that began burning off shortly after sunrise. Brian, Bonnie, and I were the only representatives of Tucker Running Club this year. Beverly chose not to run this race but did her own 3-mile workout while we were running around the mountain, and took many of the photos on today's blog post. "Is this the Day-Glo running team?" This race is always a relatively small field. Brian and I lined up close to the starting line, but left room for a row of faster runners to toe the actual line. But no one stepped in front of us! After the Tucker Middle School choir did a very nice rendition of the National Anthem - beautiful and rather challenging harmonies - Nikki Hayes gave the signal "on your mark,.... GO!" I simultaneously started my watch and pushed off on the sore leg - ouch! But then we were off. We settled into a group where there were 5 or 6 runners in front of me. In the first mile, I caught up with Brian for a moment, as he was taking it easy at the start. When he saw me on his left, he started to speed up, to which I called out "Seeing me means that you must not be running fast enough!" I kept him in view for the first couple of miles but he eventually pulled away. A few runners passed me in the second mile, and I estimated that I was in about 10th place in the middle of the race. At the start: can you pick us out in the crowd? I thought so. Those Day-Glo yellow shirts do stand out! My race strategy last year had been a run-walk approach. This time I decided to approach the race as a tempo run, trying to keep my heart rate within a steady range, 155 - 170 bpm. 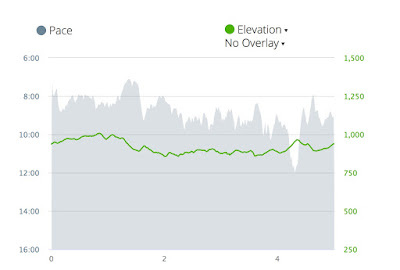 I had done a training run a few months ago in the 150 - 160 bpm range and had managed that fairly well, although when I looked back at the data this afternoon, I see that I took about 50 minutes around the mountain. Unfortunately once my heart rate rose into the range, I reached the maximum before finishing the first mile, and never dropped under 165 bpm for the race. 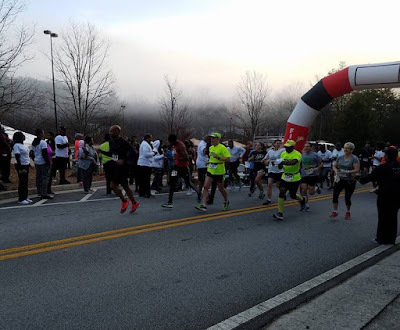 I ran the first two miles in 8:18 and 8:04 (long downhill in mile 2), but the later uphill sections were a real battle, turning in mile splits of 9:05, 9:18, and 9:27. Inverse correlation of elevation slope with pace, not surprising! The last runner to pass me was wearing all black clothes and orange-red shoes, somewhere in the middle of the third mile. He gained a lead of about 50 - 100 feet but I managed to keep up with him for next couple of miles, even up some of the most challenging hills from ca. 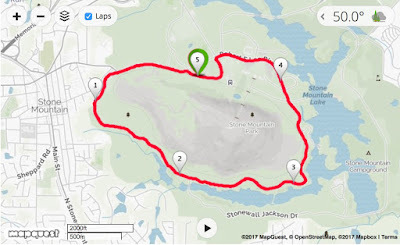 3.5 - 4.5 miles, near the Old Stone Mountain Inn. 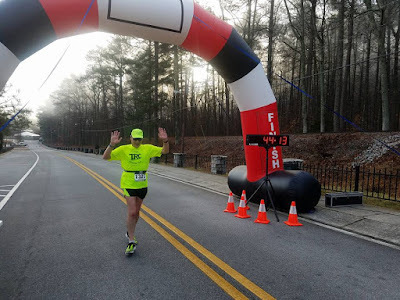 Finally cresting the top of the last big hill, I picked up the pace a bit heading downhill, reaching the big intersection at Old Hugh Howell Road where we had turned in to the last one-third mile to the finish line. The runner in black went straight at the intersection! Did he miss the turn? Perhaps he wasn't part of the race, as I couldn't see if he was wearing a bib from the back. A policeman was manning the intersection, and as I approached I pointed left with a questioning look on my face. However he was on the phone and so I decided to make the left turn. I realized later that it really wasn't the policeman's job to direct the runners. There really should have been a volunteer at that intersection, as the policeman was there to protect the runners from any automobiles turning onto the street. The hills were definitely higher this year. As I ran that final stretch, there were no runners in front of me. Typically there would be a cheering group shortly after the turn, but today, there was no one. 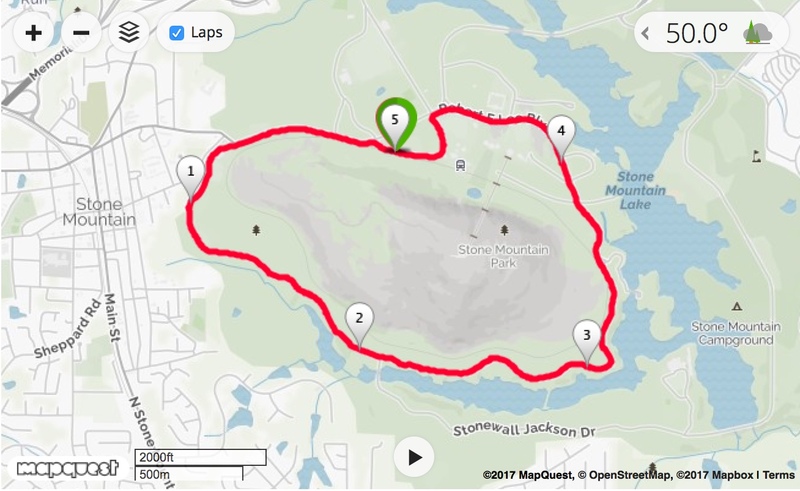 I realized that I had not checked (nor seen) a race map for this year's race. Did they change the route? Did I misunderstand the instructions given before the start? If I ran through the finish line in the wrong direction, would I be disqualified? I didn't know if I should go back to the corner and run in the direction of the other runner. 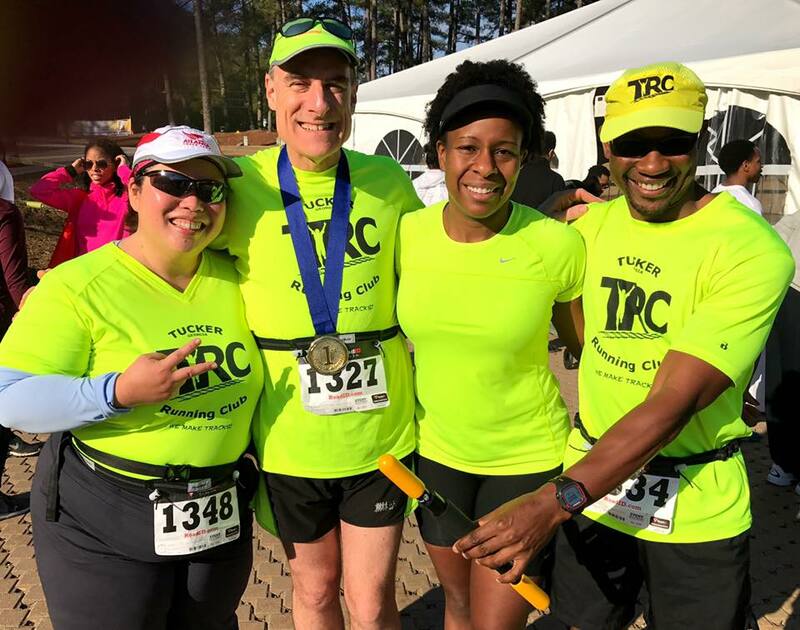 But having run the race before and the route many times in workouts, I knew that I would be running exactly 8K in the way that I was running. While all of those thoughts were going through my mind, the road curved and I could see the finish line in the distance. There was absolutely no one else running between me and the finish line. I didn't think that the other runners had opened up THAT much of a gap! As I drew closer to the finish line I could see that I wasn't going to break the 44:00 minute mark. The people cheering were all on the other side of the finish line, what did that mean? Anyway I made it through the finish at 44:12, accepted congratulations from a few of the people cheering. I'm glad that I celebrated today's finish, even if I was a little slower than in previous years. I asked the person running the timer if I had run in the correct direction, and he confirmed that I had. 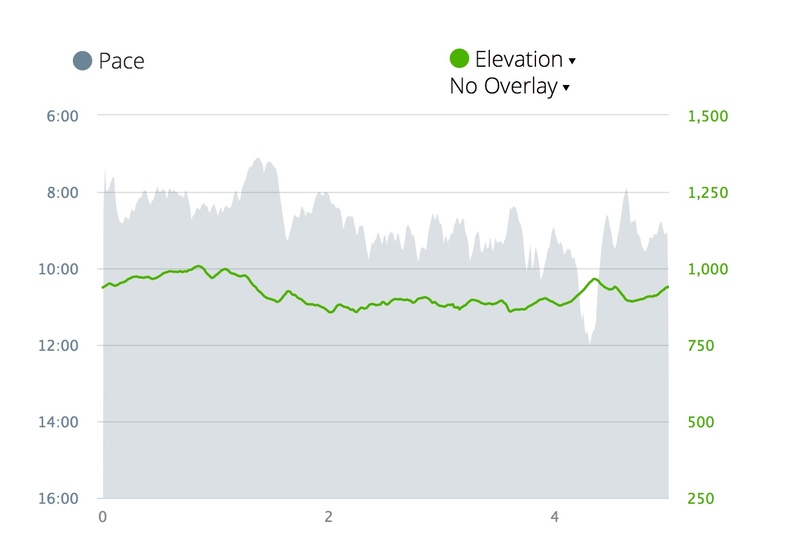 It turned out that the runners that went straight (which also included Brian) covered nearly the same distance (Brian recorded 4.95 miles, I had exactly 5.00 miles; 8K = 4.97 miles), but they definitely had a tougher hill going into the finish. I saw the runner in black in the lot - his name is David - and we chatted a bit about the race and the confusion on the last turn of the course. Later Brian told me that David had decided to turn around and followed me into the finish, although I had not noticed at that time. "Less than a quarter-mile to go, you can do it Bonnie!" After going through the post-run stretches and getting a little hydration (and hot coffee! ), I went back to the corner in question to wait for Bonnie to reach that point of the course. 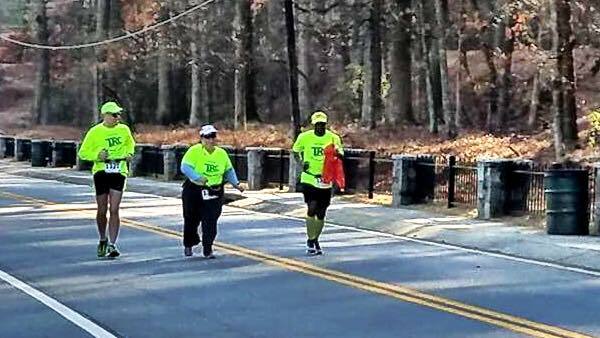 As it was a nice day, there were quite a few people walking and running that weren't part of the race, but when I saw someone with a bib, I was a de facto volunteer, pointing them to make the turn. As Bonnie came through I jogged in with her, Brian joined us for the last quarter-mile, while Beverly took photos of us coming into the finish together. 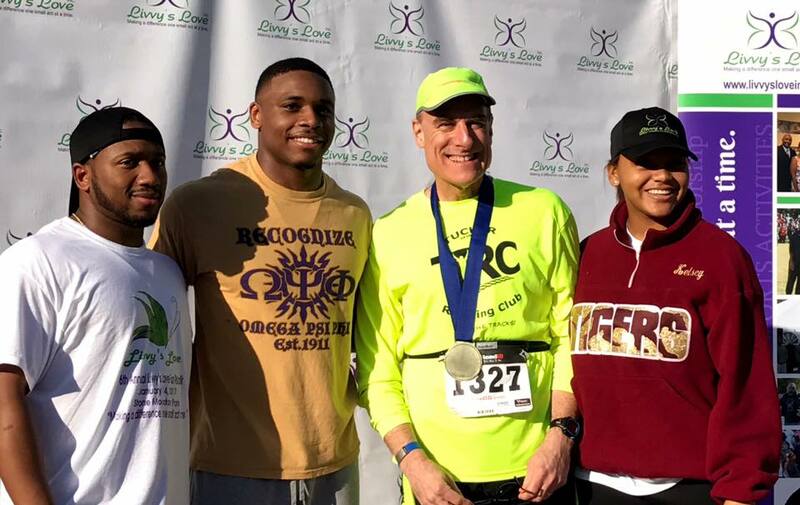 When it was time for the awards, David Johnson received the second place in our age group. 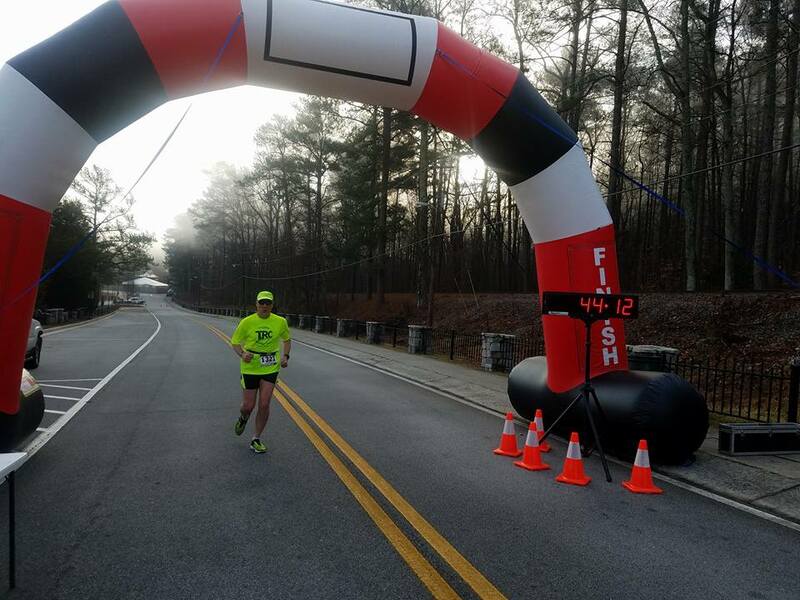 I was thinking that he had finished ahead of me and I would be third place, but then Nikki Hayes called out my name as first place in my age group! I was surprised but jogged up to accept my medal and pose for photos. I felt that my award was a bit tainted! Although I had hoped to catch up to David at the end, of course the odds were rather slim that I would have made up the ground and passed him at the end, particularly as the uphill finish was a struggle for me today. But then I decided that runners should be responsible for knowing the race route, and I would accept my prize with pride. 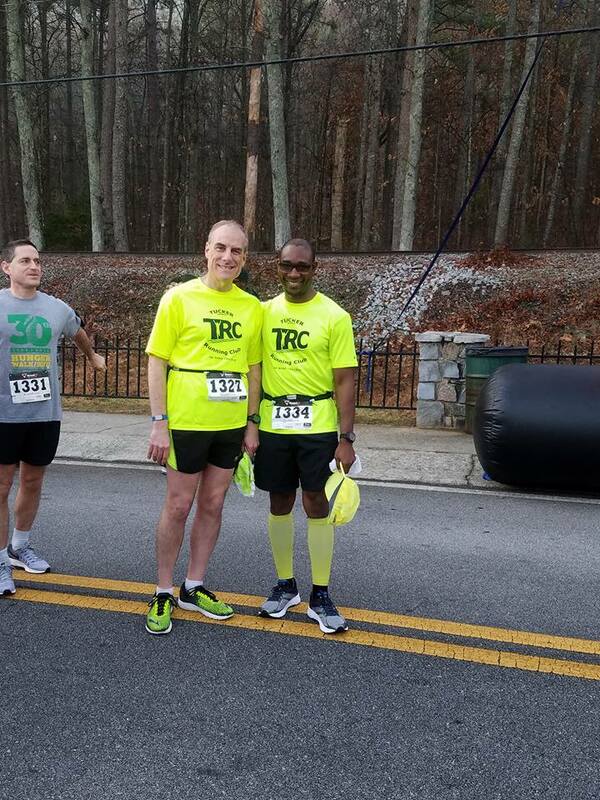 Ironically, today's run was my slowest race performance, 13 seconds slower than my 2014 time, and more than 2 minutes slower than last year's time. I will go back to the run-walk method for my next race. Bonnie, me, Beverly, and Brian showing off his roller for rehabbing calf strains. as he finished 5 minutes ahead of me, and possibly in the top-5 overall.